Decided I would re-read Nietzsche's Birth Of Tragedy after sitting in one of our Theorizing classes and getting really angry about the reductionism of art to symbols. It all felt very scientific and Appolonian to me, so on my next bookstore trip I grabbed a copy. 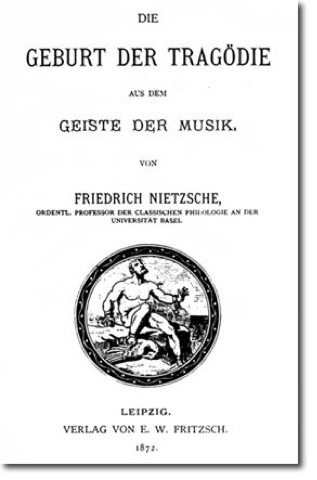 What really struck me with this read (the first time read not in relation to trying to write a paper) was the poetry of Nietzsche's language, the beauty of his text. And maybe it is because I now know the ending (I have read most of the rest of his work, including The Twilight of the Idols which re-thinks this text) but I could feel the argument leaning more toward the Dionysian than the Appolonian, though on the whole arguing for a balance. I have to agree with this argument after sitting through classes on semiotics.....I feel like as soon as we reduce so much to only appearances and imbue meaning that way, we have lost the flow, the "Music" as Nietzsche puts it. I am reminded that Nietzche's account is of the historical birth of tragedy, but the rebirth, after empirical objectivity killed tragedy through Socratism. Tragedy was ended by this, but must be re-born, as it is the other half of our understanding and experience as humans.